Wedding websites are must-haves: Everything your guests need to know is in one easily-accessible place (no fretting over misplaced save-the-dates or invitations), which makes things simpler for them and for you. 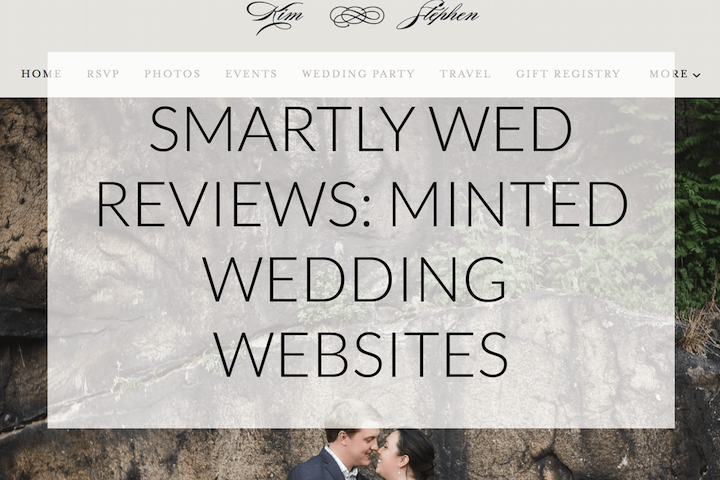 The best part is that a gorgeous Minted wedding website can be yours, absolutely free! In this post, we’re covering all of the features available through Minted: what the paid plan gets you, adding details about your big day, listing events and taking RSVPs, what you can (and can’t) customize, and how Minted’s offerings stack up against the competition. There are a lot of things to love about Minted’s wedding websites, and though there are a few changes we’d like to see in the future, we’re definitely fans! There are a few images in this post that include photos from Kim’s engagement shoot, taken by the amazing Martin Reardon. This post includes affiliate links, marked with an asterisk (*) – if you click through and/or make a purchase using these links, it generates a small amount for us, at absolutely no cost to you. We’ll always include the full name of products so you can find them easily, should you prefer not to use our links. If you do use our links, a huge thank you for helping us continue to grow Smartly Wed! Although there are affiliate links in this post, this isn’t a paid review, and all of the (many) opinions are ours. 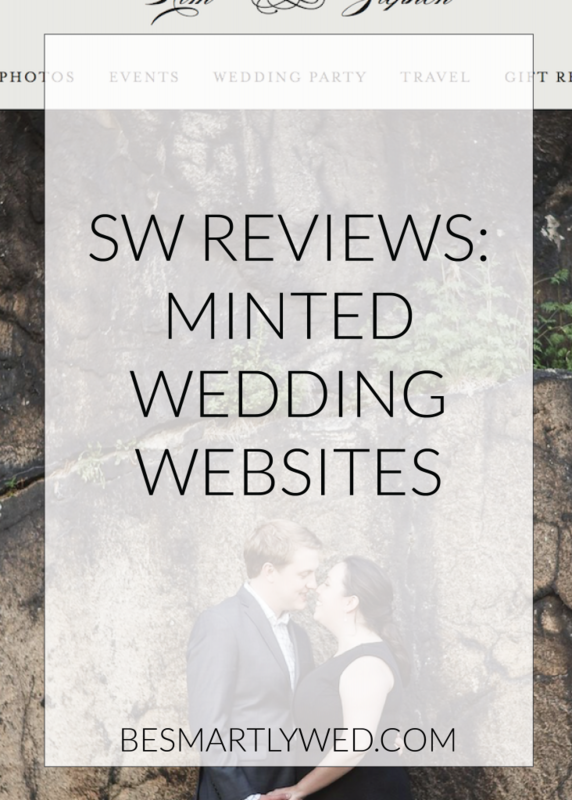 Minted reached out to us about featuring their wedding websites, which we agreed to do in the form of a review, as we’ve done with other wedding products. If you’re planning to purchase your wedding invitation suite from Minted, having a website to match is one of the strongest arguments in favor of setting up a wedding website with Minted,* as well – you should have a wedding website, so why not make it a beautiful one? There are more than 700 website designs currently available through Minted,* all of which have matching invitation suites! Minted’s wedding websites are mobile responsive, so your guests won’t have any problems looking up specifics during your wedding weekend. 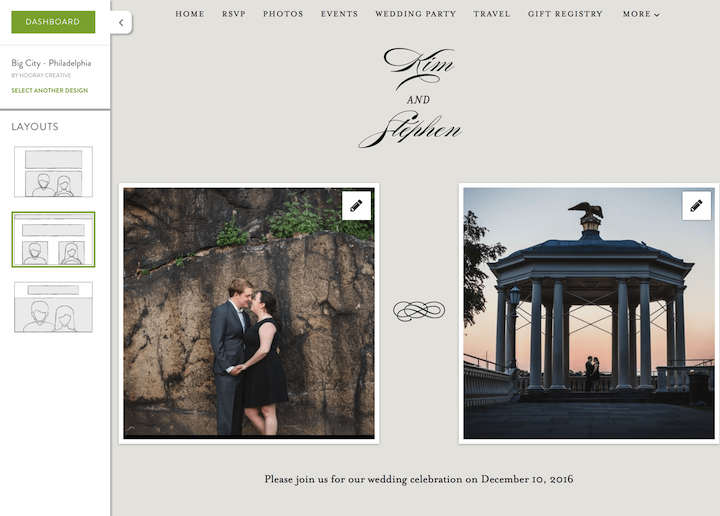 S and I ordered our invitations from Minted, but the range of available designs was significantly more limited when the wedding websites first launched, so we decided to build our site with AppyCouple * (our review of AppyCouple). 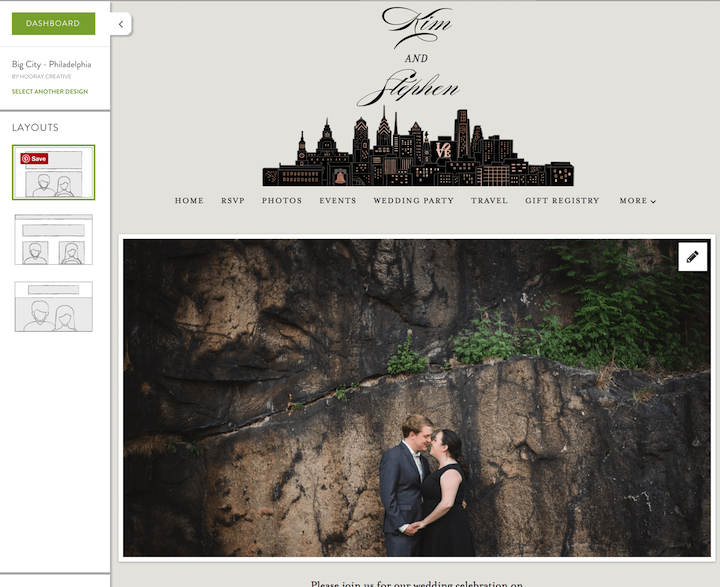 In preparation for this post, I mocked up parts of our wedding website with Minted’s site builder, and where relevant, I’ll compare Minted’s features to those offered by AppyCouple. Minted’s free wedding websites * offer more features than most other free options, with the ability to pay for a premium set of features. That paid tier gets you four extras: the ability to add a photo gallery, to add a custom URL, to add custom pages, and to password protect the site for privacy (the URL and privacy features are discussed in this section; custom pages & photo galleries are discussed under “pages,” below). Updated July 2018: The cost for a premium Minted site is $20, and if you want to keep your URL for more than a year, you’ll need to pay an annual fee once the first year is up. Minted has, in the past, set pricing more comparably with other companies like AppyCouple. Minted’s current prices have come down, while AppyCouple’s have gone up. At the time of this post (March 2017), AppyCouple charged $39 for their standard set of features and $89 for premium designs; neither price included a custom domain. As of this update, AppyCouple prices are now $49 for the standard designs and a whopping $149 for premium designs. Minted doesn’t charge extra for particular designs. According to the FAQ, your site will be available for a year, once you’ve created it, and Minted will “notify you to let you know that your expiration is approaching and let you know any options to extend the life of your website.” One year should be enough for most couples, but if you’re having a long engagement and anticipate that you’ll have many events spread out over the length of your engagement, you might want to ask upfront about your options once the year is up. Even without the custom domain, you’re able to select a personalized address formatted as [names].minted.us, and there’s nothing to preclude you from purchasing a domain on your own and forwarding it to your Minted site. Do you need a custom domain for your website? No. Are custom domains convenient for guests? Sure, they could be – at the margins, your guests may have an easier time remembering “nameandname.com” than the name you select through Minted – but unless your domain is fairly memorable / your guests have good memories, you’ll probably still have remind them where to find your site. The privacy feature you receive with the premium plan allows you to choose whatever password you want, which guests will then have to enter to view your wedding website. For comparison, with AppyCouple, you’re given a five-digit code, and have the option to pay an extra $15 to set your own password (they don’t allow any two sites to use the same password). The privacy feature is on or off with Minted wedding websites – you either have the site protected by a password, or you don’t. When the Minted privacy feature is on, I’ve had to re-enter the password (when viewing as a guest, not through my Minted account) every single time, even if I’ve just closed the window a few minutes earlier. 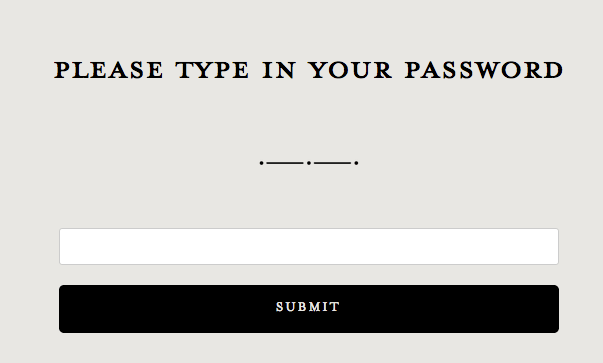 S and I originally opted to password-protect our wedding website. I set our registries, where possible, to not be searchable, and liked the idea of having our wedding website set up the same way. We included the link to our site and our access code on the back of our save-the-dates. After being asked multiple times to remind people of the code, we scrapped it, and made the site publicly viewable (though you’d have to have the exact URL to end up there). If you’re particularly concerned about keeping your wedding details private, and there are plenty of reasons why that might be the case, adding the password to your Minted site might be worth the additional cost associated with the premium plan. You’ll find the access to your site, once you’ve signed up, under “my account,” and then “wedding website.” The dashboard is clean & elegant, and very user-friendly. 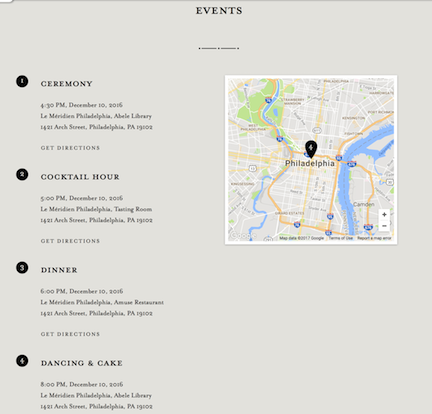 The website coordinating with each invitation can be accessed from the invitation page, under “products in the same suite” (where you’ll find maps and menus and the like, too). It’s easy to change your design whenever you’d like; you’re not locked into the first option you select. Each website design comes with a set of color options from which to choose, and these coordinate with the color options of the matching invitations. For example, the “Big City” Philadelphia * invitation suite, featuring the skyline illustration, comes in four colorways: light taupe, blush, pale blue, and mint. These have slight variations to the font color and the detail in the illustration. The “Big City Philadelphia” website * has the same four colorways. You’re not able to further customize colors, or to make any changes to the fonts. With Minted invitations, customization options are more widely available; you can change the color and the fonts (to any font Minted licenses). S and I did both of these things, so if we had chosen the site to match our invitations, it would have looked a bit off. Admittedly, I’m probably the only person who would’ve noticed (or cared), but it is something to consider. Alternatively, it’s a good excuse to choose another beautiful design that coordinates with your suite! Think about pairing based on feel (romantic, modern, etc) and colors. I imagine that the behind-the-scenes work required to allow any extensive amount of customization is probably tremendous, so allowing customers to make just a few changes seems reasonable to me (and, for what it’s worth, AppyCouple doesn’t let you change colors beyond a limited set, or fonts, either). All designs offer three layout options: 1) the large header (with a large design matching the invitations – here, the Philadelphia skyline), a large landscape photo, and your names stacked horizontally, 2), your names stacked horizontally in the header and two smaller square photos, and 3) a small header (with a tiny design matching the invitations – here, the swirl between our names) and a large landscape photo. The default for option #2 suggests photos of you and your fiancé separately, but you could use two portrait photos of you as a couple, instead, as I’ve done here. If you don’t have two photos you’d like to feature, or don’t have two photos you’d like to make square, options 1 and 3 are your best bets. You can easily toggle back and forth between them to preview your site, which is a nice feature. My favorite is the third, which allows for more of your photo “above the fold,” though I like being able to see the skyline illustration in the first layout. All three layout templates have the links to each page at the top, and present all “pages” on a single page (so, sections, rather than pages). My personal preference is to have each page actually on its own page, rather than as sections (AppyCouple gives you the ability to do this, but Minted currently does not). The FAQ page says changes to the layout, colors, and fonts aren’t available “yet,” so it’s possible that Minted will add some extra customization options in the future. Keep in mind, however, that wedding websites aren’t professional or business sites – you’re absolutely fine using a relatively simple design and having a more limited ability to customize details. 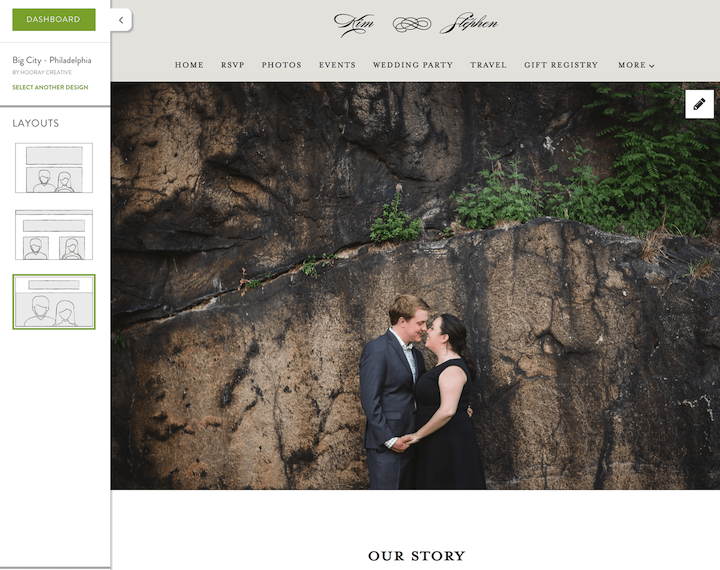 The goal of your wedding website is to provide important information to your guests, which you will easily accomplish with Minted. There are five standard pages for Minted * wedding websites: RSVP, events, wedding party, travel, and gift registry. You have the option to turn them on & off, reorder them, rename them, and, if you choose the premium plan, add other pages as needed. There’s also an option to add text to an “our story” section, though this doesn’t get its own “page” status. It sits immediately below the main photos. The “photos” page comes with the premium plan, and lets you upload a gallery of photos through which your guests can click. This is a nice way to share, for example, engagement photos or photos of you in the early stages of your relationship, but, for me, wouldn’t tip the scale in favor of paying for the premium plan (on its own, at least). The other premium features seem like ones that would clearly cost extra money to support on the backend, which seems less true with the photo gallery. The “travel” section lets you add “accommodations,” but it seems best suited for hotel blocks (vs. directions, or similar). This is an area where AppyCouple has the clear edge, for me, over the Minted sites. AppyCouple allows you to add a long list of pre-named widgets to each section of your site; on our “travel” page, S and I added the “child care” widget, as well as one of the blank “notes” options to give a few tips to our guests. It’d be great to have features like that added to the Minted sites in the future, as I think it makes the information easier to process for guests. On the registry page, the drop-down menu has 15 popular registry sites – Amazon, Macy’s, Pottery Barn, etc. – and the option to add your own, with instructions. If you use an option from the list, the URL section will pre-populate with the default address (e.g. 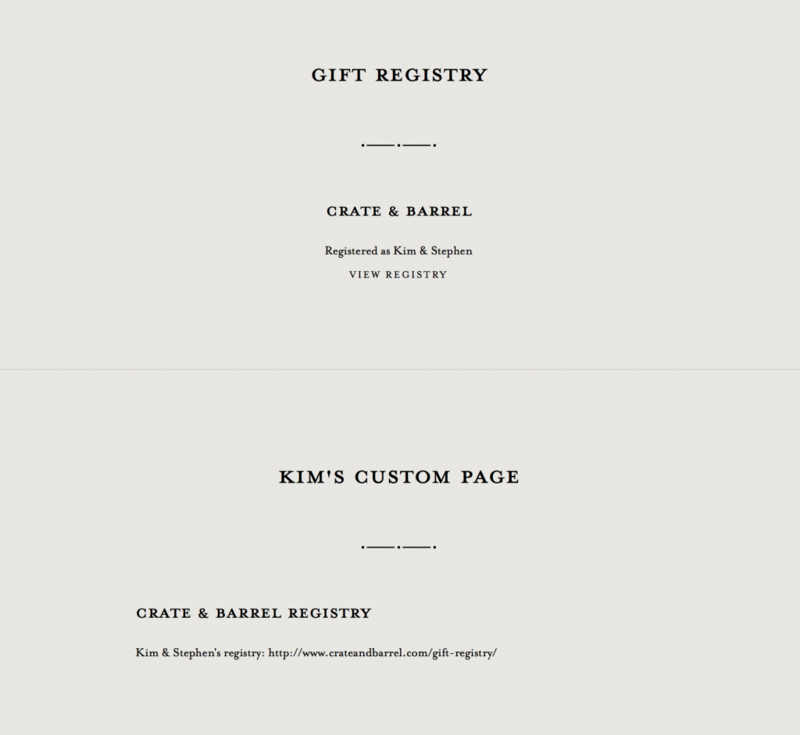 http://www.crateandbarrel.com/gift-registry/), to which you’d add your registry information. In the optional “description” box, you could list how you’re registered, to help guests who might want to search in-store. Your bridal party can be featured on your Minted wedding website, with the option to choose from one of 14 categories (like mother of the bride, honor attendant, and best man), or add a custom title. There’s a spot to upload photos, as well as add a bit about the person, how you know one another, etc. The option to create your own page, available with the premium plan, allows you to create section titles and content, and attach a photo. Minted * has all of the essentials covered with the free plan, but if you really felt like something were missing, you’d have the option to add it here. The pages can be reordered and renamed, if you’d rather call the travel page “hotels,” for example. Be careful when deleting pages! If you delete one of the default pages, you can’t get it back. Even if you have the premium plan and you recreate one of the pages, the associated widgets won’t look the same, as you can see below. If you don’t think you want a particular page, the safe option is to simply turn it off, rather than delete it. You can add as many events as you have associated with the wedding – not only the ceremony, cocktail hour, and reception, but any pre- or post-wedding events, as well. Events can have an RSVP option attached to them, including a private RSVP. I have, for example, our rehearsal dinner set as a private event, so it doesn’t show up on the “events” section of the website. The other locations will appear on the main page of your wedding website, tagged in the map, allowing guests to see all of the locations at once. A full address is required to add an event, so you can’t put something like “after party, TBD” on your list until you know where it’ll be. Even if you’re planning to send RSVP cards with your invitations, you could use Minted’s RSVP function for other events, like an engagement party, welcome gathering, or going-away brunch. If you’ve ordered invitations through Minted, and have taken advantage of their free guest addressing * for your envelopes – which you should do! There are some beautiful designs, and it saves you the hassle of having to print addresses on your own – you’ll have already uploaded your guest list to your address book on Minted’s website. Once you’ve done this, you can add guests (some or all) from that list to your website’s guest list. You’ll have the option to indicate how many guests each invitee receives: Assuming you’ve sent one invitation per couple, and one per family with kids under 18, you might want to give a specific count. The default option is “no limit,” with 1-20 as the other options. For each event you’ve added with an attached RSVP, you can include or exclude specific guests (the default is all guests invited to all events). Events created without an RSVP won’t show up here. Once guests start responding, the “RSVP” tab will show you whether a response has been received, how many people are attending, and, if you’ve added a response question, what they’ve entered. 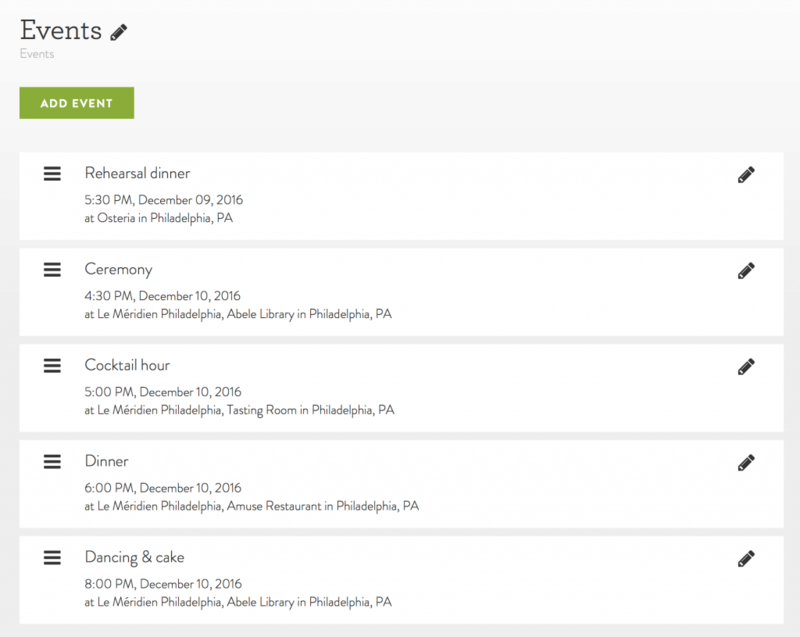 Drop-down menus let you choose the event you want to see, and give you the option to view all guests, those attending, those not attending, or those yet to reply; this seems like an incredibly handy feature for large weddings. Guests type their name into the box, and are prompted to do so as it’s listed on the invitation. It’s okay if the names don’t perfectly match what you have – for example, our invitations were addressed formally, so mine would’ve said “Kimberly,” but if I were a guest, I’d probably type “Kim” into the box – because Minted will pull up the closest match. Guests can check the option to search again, which will bring up two more matches. If neither of those are the right name, Minted doesn’t generate additional names, but sends the person back to the first search box. Once they’ve found their name on your list, your guests will see all of the events to which you’ve attached an RSVP, provided you’ve marked them as included. There are five events added to my site, but I only selected “RSVP enabled” for three of them, and those are the three events my guests would see here. If you’ve added something in the optional question box when setting up the event, they’ll have a box to type their response (as I did with the dinner event, below). You could use this for a variety of events to collect song requests, special restrictions, and so on. There’s also a box for adding notes to your guest, so dress code information, RSVP deadlines, and the like could go here. First, the search feature seems sensitive, and I could imagine it being frustrating for guests as your list grows and, particularly, as the number of people who share a name grows. The two additional names that are pulled up, if you say the first one isn’t your name, are the same every time. You’d have to change your search terms to see more options. To test it out, I entered my last name, and the only suggestions it would generate were the first three entries in my address book with my last name (which happened to be my parents, Steph, and one of my uncles). To see if I could get it to pull up my other aunt & uncle, I tried my uncle’s initial and last name – didn’t work – his nickname and his last name – still didn’t work – and finally, his full first and last name, which did work. Second, you can type a single letter into the search box, and it’ll pull up responses; I tried a variety of letters, and each time, it pulled up three names that included that letter. This is less of a concern if you’ve paid for the premium plan, which allows you to set a password (as discussed above), but you still might not want an option that essentially allows guests to search for any other guest you’ve invited (or see who wasn’t invited, I suppose, if their name doesn’t show up). 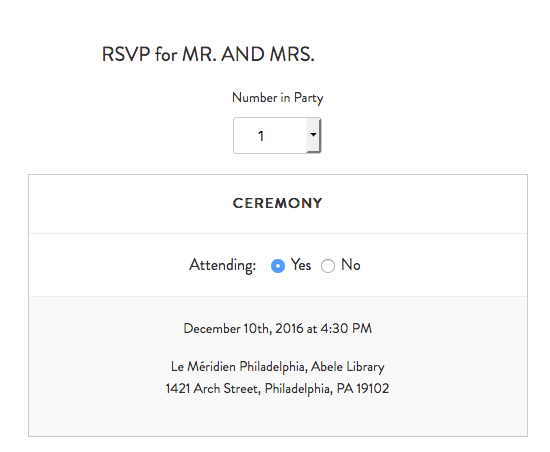 The RSVP feature on AppyCouple, by contrast, requires that guests enter their e-mail address and your wedding code (the 5-digit code). If the code is correctly entered, they type their first and last name, then are able to RSVP. 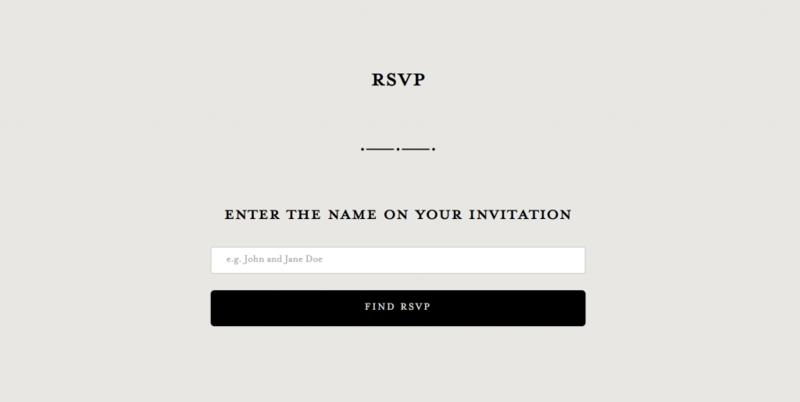 You can upload a list of guests in advance, to include certain people for certain RSVPs. This is a clunky feature (so S and I didn’t bother using it) but, as far as I can tell, there isn’t any way they’d see other guests’ names. The Minted wedding websites * are robust, given that most features are available entirely for free, and the premium features come at a competitive cost. If you’re planning to purchase a Minted invitation suite, their wedding websites give you a thoughtful way to link the colors and patterns of your invitations, and possibly your entire wedding, to your website. We’d love to see Minted add some additional features in the future, though would certainly recommend their sites as a great option for brides and grooms, even without any of those changes! Which Minted website design is your favorite? 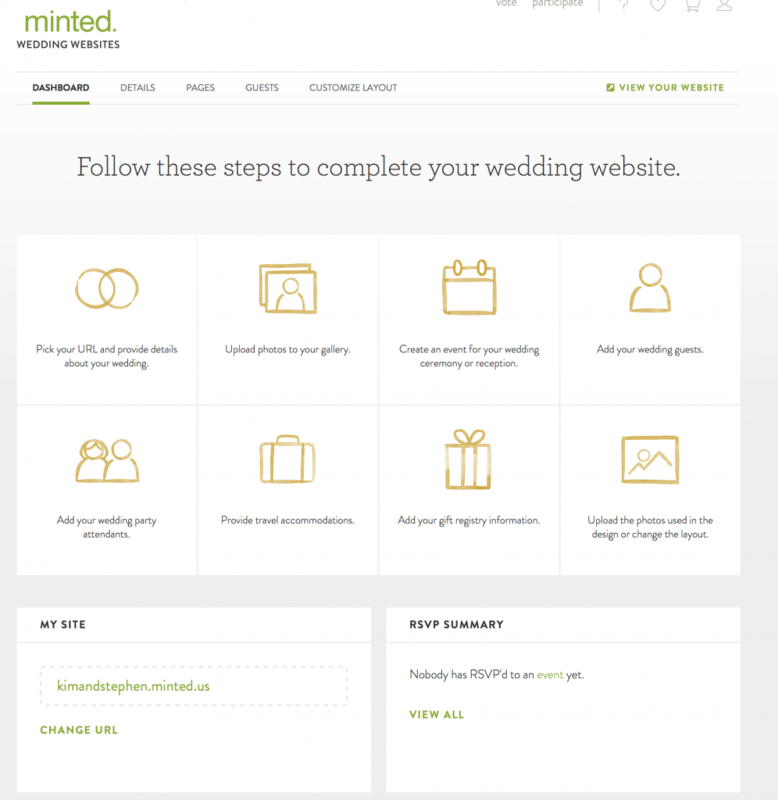 Are you planning to make your wedding website with Minted? Leave a comment and let us know! Thanks so much for this post! I’m still in between Minted and Appy Couple. I like the idea of having a private website but I also want it to be user friendly. Which would you recommend over the other? Thanks so much for stopping by! Both are user-friendly, in my opinion, as they look good on mobile. Appy Couple is now up to $49, and Minted has dropped the premium price to $20, so I’d have to go with Minted on price alone (they used to be the same, or very nearly the same). I thought the Appy Couple app was a great feature that Minted doesn’t offer, but none of our guests used it, so that’s something to consider. I’d recommend starting with a free Minted site, and see how you like it (you don’t need to add much in the way of details, to alleviate privacy concerns) – if you’re a fan, the $20 may be worth it so random people can’t find your site. We’d love to know what you decide, and what you like best! Happy Thanksgiving! Thank you so much for sharing this review! I’m a little overwhelmed with all the website options out there. Appy Couple and Minted are two that I’ve been reading a lot on- but I’m still not sure what’s best for me. Other then privacy, I’m looking for a website that allows me to limit plus 1’s, create custom pages such as (a page where I can included a link for a money registry), ability to send out mass reminders, the ability to upload multiple pictures and videos and of course, aesthetically pleasing and user friendly. I have a big guest list so I’m looking for an outlet that will be convenient, user friendly for both sides and that allows effective communication to take place. I’m not sure if there’s a way I could speak with you or anyone on this matter. It would truly be helpful for me! I want to pay for the right thing. I would love some advice on this. Sorry for the LONG comment. Thank you! * Privacy: included with Minted premium (currently $20) and all Appy Couple sites – if you have questions that I didn’t get to in the post, feel free to reply and let me know! * Plus 1s: Both sites let you do this – Appy Couple suggests adding couples individually and then grouping them, or giving someone the plus one if you don’t know the name of the plus one (this would also work if you’re inviting kids). This would change how you format your guest list before uploading it. Minted lets you set the max party size for each guest (1-20, or “no limit”). I recently RSVPed on a friend’s Minted site, and it was really simple – I had the option to RSVP for one or for two, and only the events to which I was invited showed up. If you’re ordering Minted invitations and having the envelopes printed with guest addresses, those names will be available in your account to work with for the RSVPs. Both sites will let you do what you want with plus ones, I imagine, but I found the Minted dashboard to be simpler. * Custom pages: You can do this with Minted premium, not the free version. I haven’t seen anything suggesting Appy Couple has this functionality, but if what you have in mind would fit under one of their “sections” (like RSVP, transportation, etc. ), you can add a widget to make this happen. You can also rename sections if that’s of interest. On adding registry links, specifically: Appy Couple has a ton of pre-loaded registry options, but there’s also the option to do a custom link, so if the one you want isn’t there, you can add it (and then wouldn’t need a custom page). * Sending reminders: Both sites will let you send reminder e-mails for events, but Appy Couple has additional options, if you think you’d want to use them (requests for addresses, save-the-date e-mails, thank yous, etc.). The Minted setup is a bit confusing: They don’t let you save guest e-mails in your address book, so in order to send reminders, you have to have an online invitation set up. I initially thought this was an event from the wedding website, but it isn’t. You have to send an actual online invitation – https://www.minted.com/online-invitations – and that’s where your e-mails will be stored, and where you can send follow-ups. If you’re sending paper invitations, you can let people know to go online to RSVP, but you won’t be able to easily e-mail all of the people who haven’t done so (you’d have to cross-check your list and then manually e-mail them). Minted has a lot of great e-invite options, but if you’re not planning to use them, e-mailing guests with Minted could be more hassle than it’s worth. * Uploading photos & videos: I’d give the nod to Appy Couple here, too. I don’t see anything on the Minted site that suggests guests can upload at all, nor could I find anything about uploading videos. My photo upload page is just that, photos only. Appy Couple lets you have videos on your cover page and your stories page (possibly others, though I’m not certain that’s the case), and lets guests upload photos. It doesn’t appear that guests can upload videos, however. If your guests will use the Appy Couple app – mine didn’t, but we also didn’t encourage them to do so – they can upload photos directly, which is handy. * Aesthetics & ease of use: You could really go either way here. There are things I like a lot about Minted’s dashboard vs. Appy Couple’s, but the Appy Couple widgets allowed me to customize more and were really easy to use. Minted lets you match your site to your invitations, which is cool, and I personally like more of those looks than I do the Appy Couple designs. I did love the Appy Couple design I chose, but there weren’t many others I would’ve wanted. You can preview the designs before selecting, so I’d be sure you’re happy with how the Appy Couple ones look before buying. As a guest, I’ve only used Minted sites, and have found them easy to navigate. I personally think the Appy Couple sites are more robust in terms of customization, but would an average guest (/ not me) care about this? Maybe not. I am in the process of creating my website and I have trouble finding the feature where you can turn off a page. I realize this article was written last year and maybe there’s been a few updates however, I hope they didn’t remove this option. I didn’t want the RSVP page to show since I am sending out formal invitations. But I want to keep the page in case I decide to use it for other events. Please help. 1. To make the RSVP page itself go away, once I was on the dashboard, I clicked on “pages” and then “manage pages” (at the bottom of the menu, for me), and then clicked on the gear icon on the right, next to RSVP, turned “visible” off, and saved. 2. I went to “events,” under “pages,” and then unchecked “RSVP enabled” under each one (you have to save each individually, it seems). The RSVP page no longer shows up for me, when I view it as a guest, and I’d suspect the first step is enough, but you could do both just in case! If that doesn’t work, I can try to help further! Will Minted let you collect the name of an unknown plus one? Will it let you write who is receiving each entree type when there are multiple people? Thanks for your questions! Yes to both, but the way to do it is a little clunky, as far as I can tell: You can give each guest a “max party” size of 1-20 or choose “no limit,” so you could put in someone’s name with a max party size of 2. You’d then need to add an RSVP question where guests could enter the plus one’s name. There wouldn’t be a way to show that only to guests with an unknown plus one, however. The food question would be handled the same way – you’d add an entree question to the event, and you’d have to ask guests to tell you who wants what. You’d have the same issue even if you just wanted a count and not a specific entree associated with each guest, because you only get an open-text response box (not checkboxes or the like). AppyCouple handles both of these issues more efficiently. You can give someone a plus one (or multiple plus ones) and they’ll be prompted to type the name when they RSVP; if you know the name, you can enter it when you set up your guest list. 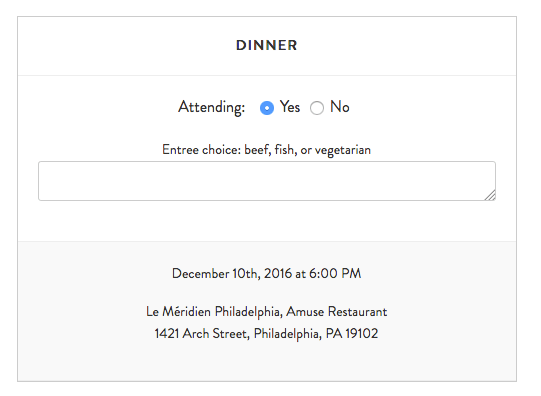 You can also add a multiple-choice option for guests who’ve said they’re attending and ask about entree choices, which will be specific to each RSVPed guest. There are, of course, other pros and cons between the two website offerings, but on this front, AppyCouple does it better. For my ceremony kids are invited, but not for the reception on a different date. Once the guest enters their name to rsvp on the minted platform, is it possible to enter a different number of guests for each event? I couldn’t find the answer on their help page, so tried changing the settings on my own site, and I don’t see a way to do this. You’re able to set the max party size to allow for dates / kids, but it’s all-or-nothing in terms of events when you do that. The only way around it would be to have the kids listed as separate guests, but then the parents would need to RSVP for each person. I tried the same thing on the AppyCouple site, to see if their functionality allows it, but found the same thing. You can group guests easily with AppyCouple, but you still need them to be listed separately if they’re invited to separate events (i.e. an entry for person A & an entry for person B, vs. an entry for “person A & person B”). Thanks for taking the time to write and let us know if you have other questions! FIND US ON SOCIAL MEDIA @SMARTLYWED! INSPIRING BRIDES AND GROOMS WITH THE BEST OF THE PHILADELPHIA AREA!